A Las Vegas slot machine tycoon and an array of other investors have pumped more than $32 million into the Plainridge Racecourse in Plainville during the past decade in hopes of seeing Beacon Hill legalize expanded gambling in the state. The group — which includes Las Vegas-based Stanley Fulton, who made a fortune in the slot machine business, and former top Massachusetts racing industry regulator Gary Piontkowski — is preparing to double down on its bet. Undeterred by the collapse last summer of gambling legislation at the State House, Piontkowski and his fellow investors in the Plainville racetrack are poised to make another push this year on Beacon Hill. Piontkowski makes no bones about the fact that he and his fellow investors have long been interested in winning a green light to roll out slot machines at Plainridge. But the group also shares ties that go beyond a desire to open a profitable slot machine complex, he said. Piontkowski noted that he and the track’s other two top investors — Fulton and local businessman Alfred Ross — are all avid horse racing fans as well. Fulton, who could not be reached for comment, has spent untold amounts of money training horses, with three having made it all the way to the Kentucky Derby. Ross and Piontkowski are regulars on the racing scene as well. On the table are plans for a $160 million-plus gambling complex that would feature slot machines, a 120- to 150-room hotel and, of course, the track. The track’s roster of deep-pocketed investors has played a crucial role keeping the track afloat amid years of financial losses and bitter defeats at the State House. While Piontkowski, chairman of the Massachusetts Racing Commission in the early 1990s, has become Plainridge’s public face over the years, its main financials backers are less well known. Fulton is the largest single investor in the track, with a 31 percent stake, according to the Massachusetts State Racing Commission. He is a high-profile public benefactor in Las Vegas, having donated millions to the University of Nevada Las Vegas, where a building bears his name. Fulton made more than $300 million when he sold his video slot and casino company in 2000. A horse racing enthusiast, Fulton opted to hang onto two racetrack investments — Sunland Park in New Mexico and Plainridge. Fulton’s involvement in Plainridge dates back more than a decade, when an arm of his old company provided equipment to the racetrack. Ross, a businessman based in South Dartmouth, is Plainridge’s second largest investor, with a 29.9 percent stake, state records show. He was previously part owner of the Twin River Casino in Rhode Island before it was sold to a British gambling firm in the 1990s. Ross, who has been involved in horse racing all his life, said a key to Plainridge’s future is whether the Legislature legalizes slot machines this year. Plainridge was initially profitable but has become a money loser over the past five years, and needs the extra revenue that slot machines would generate to keep live racing afloat, he said. While simulcasting is profitable, running live races is not, he said. He’s still optimistic state lawmakers will pass a gambling bill, but noted that years of failed proposals have taken their toll. Piontkowski has the third largest stake, with a 7.4 percent share in the track. There are 15 additional investors with smaller shares in the track, mainly local businessmen, including Patrick Carney, head of a Bridgewater-based real estate company, Claremont Management. Carney said he is willing to hang in longer, but his Plan B calls for redeveloping the track into a retail site with big-box stores. The gambling venture has cost the investors money over the years. Plainridge’s investors have pumped at least $32 million into the track over the past decade, Piontkowski noted. That number, in turn, may soon hit $35 million, he added. The first big expense was developing the track more than a decade ago. Since then, each year has brought additional losses, with Plainridge’s backers subsidizing the money-losing operation as interest steadily dropped in live horse racing. After the collapse last summer of gambling legislation, the track was forced to cut 160 employees and contract workers as losses for the track mounted and prospects for a major slot machine complex faded. Yet despite the losses, Plainridge’s investors keep chipping into the pot. 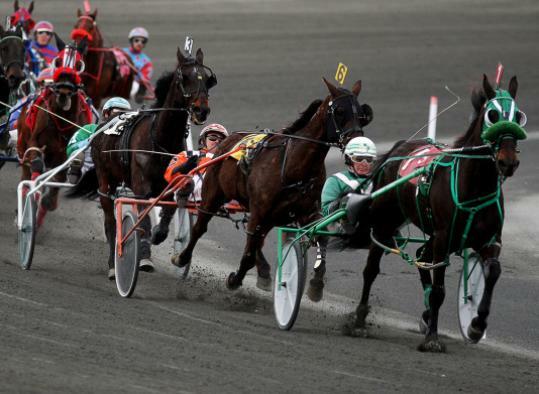 The track and its backers are preparing to make their case all over again on Beacon Hill, with hopes of persuading the Legislature that a green light to roll out hundreds if not thousands of slot machines could prove to be a winner both for the track and the state. House Speaker Robert DeLeo has pledged to push for a gambling bill again this year, with hopes for swift action early in the legislative session. The decision to keep plunging ahead comes as the track’s investors have adjusted their expectations, according to Piontkowski. The track and its investors had hoped to win approval for slot machines a decade ago, only to have their hopes dashed repeatedly after one gambling bill after another was defeated on Beacon Hill. One of the hardest blows came last year, when the House and Senate agreed on a bill, but Governor Deval Patrick objected to putting slot machines at Plainridge and other racetracks. But Piontkowski and other Plainridge investors see reason for hope. All three top state leaders favor some form of expanded gambling, a first for Massachusetts, and all look to be in power for the next few years. Last year’s bill was by far the closest any gambling legislation had come to clearing the State House, Piontkowski said. But other people hoping for a long-awaited start to casino style gambling in the state recognize the uncertainty in the bet that backers of gambling are placing. Steve Norton is an investor with a group that owns a Palmer site on which Connecticut’s Mohegan Sun operation hopes to build a casino. He knows there is a bit of gambling going on among those who are hoping for a payoff when, and if, big time gambling comes to Massachusetts. “We are in the gambling business and we have been known to take gambles ourselves,’’ Norton said.